North West Gaul. Celtic. 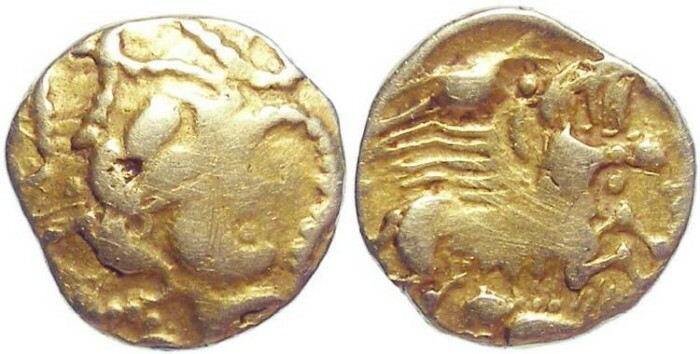 Armorica gold 1/4 stater. Late 2nd to early 1st century BC. Tribe : Traditionally attributed to the Veneti, but most likely issued by an associate of the Namnetes with Veneti influences. Denomination : Gold 1/4 stater (fairly high grade gold). Date : Late 2nd to early 1st century BC. Reference : See John Hookers research at the bottom. Size : 11.5 x 12.2 mm. Weight : 1.86 grams. Grade : Fine for type. Some faint hairline scratches that look far worse on the image than they do when viewing the actual coin. The color is a very even gold (not patchy as the image suggests) and about that of 20 to 22 Karat gold. Rarity : Very rare, only 10 known examples including this one, one of which is a fouree. Obverse : Head to right surrounded by beaded cordons, weakly struck in the centre. Reverse : Winged human-headed mare to right, remnants of chariot driver above, quadrilateral banner hanging before (mostly off the flan), Human figure with pony-tail below to right lying facing upward with arms raised in the orans position. 2. Ex. de la collection Guillemot, La Rochelle, publi� par A Barth�lemy (RN, 1846, p. 263-264 No. 6. pl XIV no 6. 3. Ex de la collection A Le Boucher, Caen (Lambert, 1864, p. 25, 92, Pl. IX no. 9) 36 grains (= 1,91 g.). 4. Ex. du mus�e de Nantes (Parentou, 1878, p. 79, No. 12, Pl. 40 ; De Lisle du Dreneuc et Soullard, 1903, p. 225 No 559 ; Mainjonet, 1973, No. 179) : 2, 05 g. La provenance de Nantes, indication tardive, n'est pas assur�e. 6. Ex. BN 6911 (LT, pl. XXIV) ; 1,95 g. Le droit est caviard�. 7. Ex. trouv� � Rumengol, dans le Finist�re (Jarno, 1903, p. 87-99, pl. 1, fig 9) ; 1,94 g.
8. Ex. de la collection R. Kerviler (Colbert, 1957, p.42, pl I no. 5) : 1,94 g. Il porrait provenir de la r�gion de saint-Nazaire. Le droit est caviard�"
In all of the other examples, the device below the mare is off the flan. This is the first example where it can be identified. Boissel speculated that the coin was "imitated" from the Veneti by the Namnetes or the Osismii. Philip de Jersey (_Coinage in Iron Age Armorica_, Oxford, 1994, p. 70) responds: "but there is precious little evidence to support or refute this". Now that the figure below the mare can be seen, it lends support to the Namnetes rather than the Osismii, as this same figure can be seen below the horse on Namnetes gold staters where it usually grasps the legs of the horse. De Jersey also says of other uncertain coins of this phase that "they should perhaps be seen as the product of smaller areas or individual chieftains on the periphery of the major groups"
(ibid, p.74). I agree with this assessment. The winged mare might be associated with the Celtic goddess Anu in her horse form. She is also one of the three aspects of the Morrigan, believed by some to have been a mare goddess associated with war and fertility. A Traditional Irish story refers to the mating of the king with a mare to legitimize kingship. A particular two-peaked Irish mountain is referred to as the "paps of Anu" It is first seen on the coins of the Aulerci Cenomani (although the "mare aspect" is not clear on these coins).